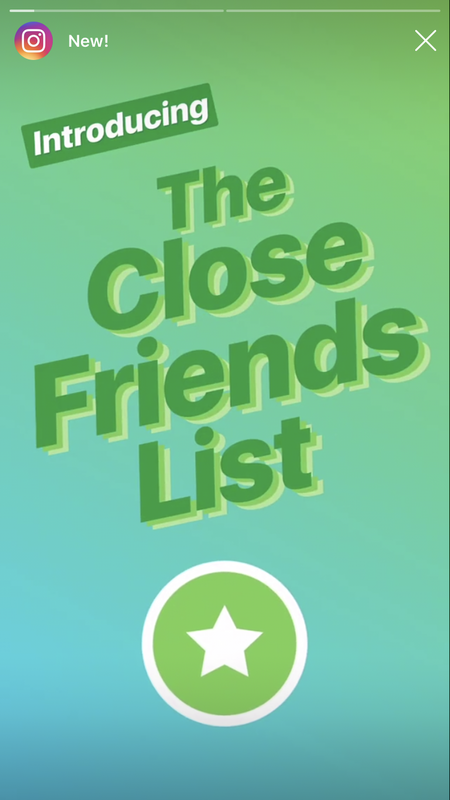 Instagram started rolling out a new feature this week in the form of the Close Friends list option for Stories. Now instead of choosing between uploading or recording something directly into your Story or sending it as a DM to a friend or Group DM, you can have a specific group receive something in a Story format. But if you’re reading this blog, you’re probably not a teen nervous about choir auditions (if you are, thank you for reading and you’re going to do great!) so let’s get into how brands can use this feature. How can brands use this feature? Create a Close Friends list that includes brand advocates and/or influencers you want to test products, content or other brand-related things with. Think of it as a new format for digital focus groups. You could also set up a Close Friends list around a few contest winners who get exclusive access to something related to your brand— like an interview with someone prominent behind your brand, an influencer you work with, or even a behind-the-scenes tour or Q&A. As with all new social features, we’ll see how brands and influencers get creative with it over the coming weeks and months. In the meantime, you can read more about it on Instagram’s blog. Got an idea for an Instagram quick tip or something you’d like covered? Tell us about it on Twitter @UnionMetrics. And find more quick tips here.